Take a byte out of geology with Mini Me Geology’s new Quartz Types collector mineral kit. This fun GeoBytes kit is perfect for kids who love to find interesting rock, mineral, and fossil samples. Quartz is the most common mineral on the Earth and it has many different forms and colors. This awesome mineral kit has samples of amethyst, rose quartz and citrine. Also included with your samples is an information card with details about your new minerals and how they are each a form of quartz. 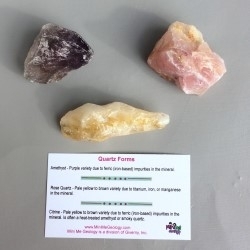 You’ll love these three colorful forms of quartz. Add them to your rock and mineral collection today! 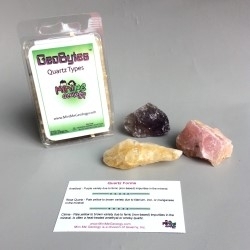 3 Types of Quartz – Take a little byte out of geology with this fun GeoBytes kit with three colorful types of the mineral quartz. The kit includes purple amethyst, pink rose quartz, and golden-brown citrine. Information Card Included – An information card with details about your new mineral specimens and why they are different colors is included. Educational – Mini Me Geology’s GeoBytes kits are educational because each kit has a theme. The Quartz Types kit teaches about the different colors that a mineral can naturally and unnaturally occur depending on its environment and specific treatments.